Lifting equipment specialist Tadano has launched a new Mantis work platform that is compatible with the entire Mantis series of crawler cranes, hence adding versatility to the range. The new Tadano Mantis work platform can be attached on to any models in the Mantis crawler crane range, adding to its versatility. The Mantis work platform is a personal lifting device allowing operators to work safely at height and has a load capacity of 340kg with the deck measuring 1828mm x 914mm. It was custom designed and manufactured by Tadano Mantis in the United States. The platform, weight and arm of the Mantis work platform have all been specifically designed so as to be compatible with every model in the Tadano Mantis crawler crane range. An adaptor designed for each model makes the connection between the boom and the platform. Tadano’s Mantis range of crawler cranes comprises nine models from 27 tonnes through to 120 tonnes. 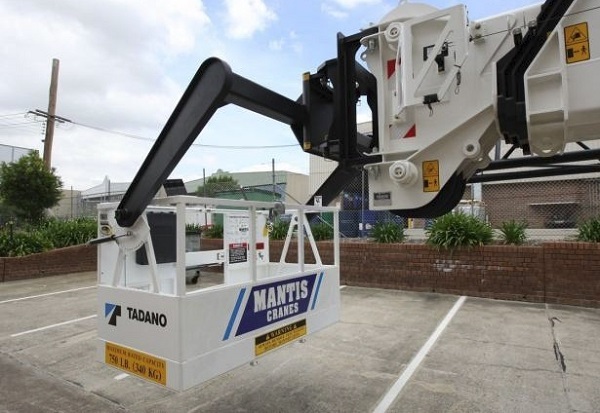 Tadano Mantis Sales Manager for Tadano Oceania Bill Dunn says the availability of the new work platforms helps operators save significant time and cost. "By attaching the Tadano Mantis work platform to the boom extension of a Tadano Mantis crawler crane, an aerial work platform is provided in a matter of an hour," he says. "The work platform attaches with pins rather than bolts, making the process quick and tool free. There is no need to bring on a dedicated boom lift to the job and incur the hire, transportation and other associated costs of extra equipment." "It also means the work site is not cluttered with additional equipment." Additionally, the Mantis range of cranes is designed to work on rough terrain, and when combined with the Mantis work platform will allow operators to carry out tasks where generic boom lifts cannot access. The Tadano Mantis work platform attaches to the end of the Mantis crane’s first section of fly jib with a series of pins and a purpose designed and certified adaptor. Once fitted the platform is ready for work. 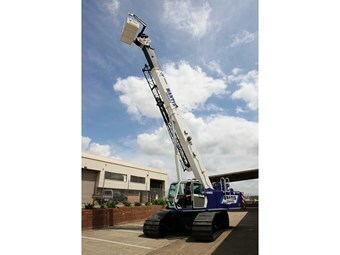 The platform itself is a heavy-duty all steel construction with a self-levelling capability. Design features include a swing-in entry door, non-skid floor, interior hand rails, tool storage racks, D rings for attaching safety lanyards and an all-round 150mm toe-hold. The Tadano Mantis work platform is operated from the crane cab by its operator utilising normal crane controls under monitoring by Tadano LMI system in response to instructions from workers on the platform. By selecting work platform mode on the AML-C, lifting chart is switched to the work platform chart enabling the AML to monitor the work platform application. Tadano Mantis work platform equipped cranes has a crane mounted DC powered emergency back-up hydraulic pump installed with the purpose of retracting and lowering the boom in work platform application for fail safe operation.